The yield that a bond is purchased at tells an investor what they will earn annually if the bond is held to maturity. 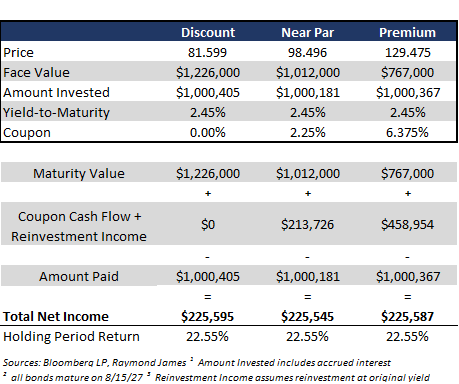 The three “pieces” that work together to determine a yield are: the price of the bond, the cash flow the bond generates (coupon), and the maturity date. All three of these inputs are critical pieces of information needed to determine how much an investor could earn on the investment. Yet, it is not uncommon for investors to let the price of a bond be the determining factor as to whether a bond should be considered for purchase or not. These investors are making decisions based on an input into the equation, instead of analyzing the output. Price alone tells you nothing, whereas yield tells you everything. The chart below hopefully shines some light on this subject. Three bonds with identical maturity dates but with very different prices are compared. All of these bonds have a yield of 2.45%, meaning that an investor would earn 2.45% annually if they purchase any one of these positions. Knowing this, most investors should be indifferent as to which of these bonds is purchased, yet in reality, many would not even consider the bond priced at a large premium. In not even considering bonds priced at a premium, many investors are eliminating a large portion of the potential “buy candidates” right off the bat, limiting themselves to a small corner of the market and potentially missing out on valuable opportunities. “Am I losing money if I buy a premium bond?” You are not losing money if you buy a premium bond, you are earning whatever the yield on the bond is when you purchase it. If you were losing money, the yield would be negative. The bottom two rows of this chart are what inpacts an investor’s wealth, yet many investors focus on the top row of the chart. The yield tells an investor what those bottom two numbers will be, not the price.